Three Saturdays in December: Merry – Join in the holiday cheer for the last of the Three Saturdays in December – Eat, Drink & Be Merry! On December 17th, collect merry holiday toasts and quotes and contribute your own to a community holiday card that will be displayed prominently downtown. Frederick Symphony Orchestra, The Season of Giving Concert – Friday, December 16, 2011 at 8:00 pm and Saturday, December 17, 2011 at 3:00 pm. at the Frederick Community College, J.B. Kussmaul Theater. Get ticket online. 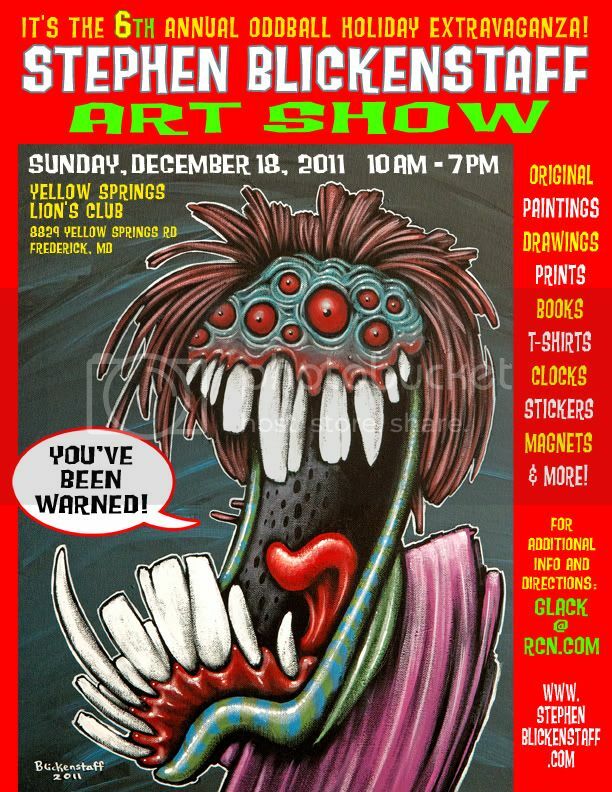 6th Annual Oddball Holiday Extravaganza – Local monster artist Stephen Blickenstaff will be showing and selling his original paintings, drawings, prints, books, T-shirts, clocks, stickers, magnets and more this Sunday.